This photo was taken on Inchydoney beach recently. Did you take any other interesting photos at the beach? # posted by Pure Cork Boy : June 27, 2006 12:29 p.m. 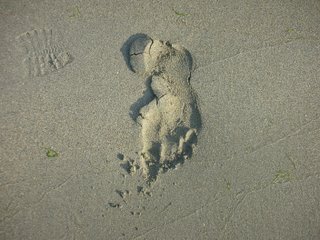 I took some pictures of a sailboat and the beach but I liked the footprint picture the most. # posted by Betty the Sheep : June 27, 2006 3:44 p.m.
Nice pic - it has a faintly space-y, otherworldly quality to it, like the outline of the 'face' on the surface of Mars. # posted by Anonymous : June 30, 2006 11:19 a.m.